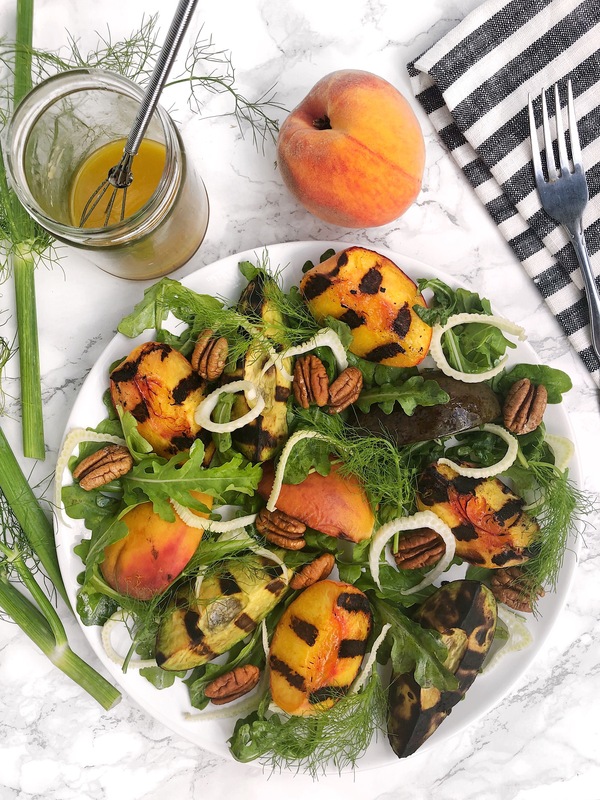 Grilled Peach + Avocado Salad - Are You Kitchen Me?! Summer is almost over! 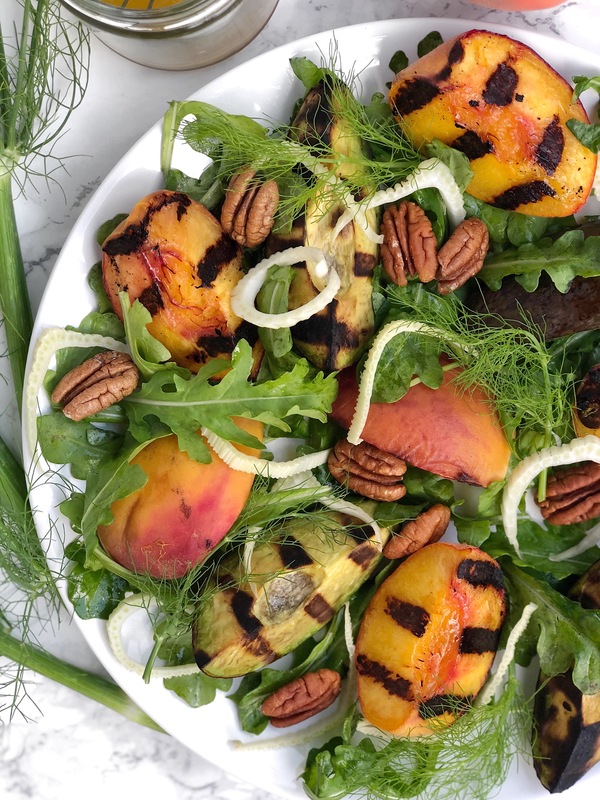 Soak up the last bit of summer flavors by firing up the grill for an easy and delicious Grilled Peach + Avocado Salad! It feels like summer is slipping through our fingers like warm sand on the beach… I try not to spend too much time anticipating cooler months, I have enough anxiety and depression in my life without that kind of negativity. Unlike most of my female millennial peers, I do not pine for the pumpkin months. Born in July, I’ve just always been a summer baby. When I saw that the Peach Truck was coming to Columbus this year, I had to get in on it. (Totally not a promo for them, I just love their peaches!) Because you can only buy them in half-bushel (25 pounds!) boxes, we had a lottttt of peaches to eat through. I also picked up a pound of their fresh Georgia pecans, which I am OBSESSED with. I had to get creative to use up all our fuzzy little peach friends… I asked for peach recipe ideas on IG and someone recommended grilled peached with ice cream. Yum. But with all the syrupy sweet fruit we’d been eating, I was craving something a little more savory. So I fired up the grill (ok, John actually does that because I don’t mess with fire…) and tossed on some ripe-but-still firm peaches and avocados. You don’t want the ones that are melt-in-you-mouth, fall-apart-tender juicy because they won’t hold up on the grill. Don’t worry, grilling fruit softens them, brings out their natural sweetness, and adds a bit of caramelization. Here’s to soaking up the last of summer’s warmth, sun, and sweet, sweet peaches. Heat a grill to medium-high heat. Brush the grates of the grill with high-heat oil (vegetable or avocado). Brushing the peaches and avocados too if you are worried about sticking. Place the peaches and avocados on the grill, one of their cut sides down. Cook for about 5-6 minutes, turning carefully to char each side. Keep brushing lightly with oil if they things get sticky. Wisk the dressing ingredients together in a small bowl or jar. Add a pinch of salt and pepper, taste, and adjust if necessary. Assemble the salad: toss the arugula and fennel in a large bowl with half of the dressing. 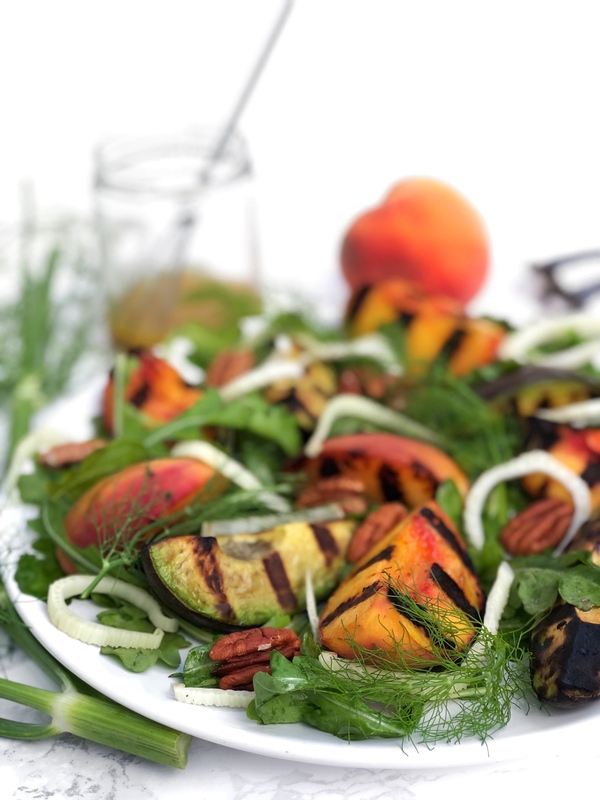 Divide greens between plates and place peaches, avocados, and pecans on top. Pour over more dressing if desired. Garnish with fennel tops. Welcome to Are You Kitchen Me?! 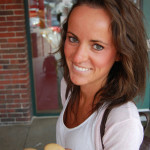 Where I write about food, healthy lifestyles, and post my favorite recipes! Are You Kitchen Me?! © 2018. All Rights Reserved.